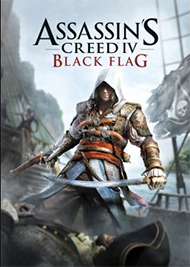 As a true-blue fan of the fictional swashbuckling pirate, I was as skeptical as the next person when Assassin's Creed IV: Black Flag was announced. After its previous two releases in the series got a lukewarm reception from fans, it seemed natural to question whether the company could do justice to an adventure set during the Golden Era of Piracy. All of us pirate fans here at Cheat Code are pleased to know that we needn't have worried, as our PlayStation 3 review of the game reported. My job, then, is an easy one: to check out how Black Flag plays on next-generation devices by popping it into the PlayStation 4 and taking the captain's wheel for a spin. 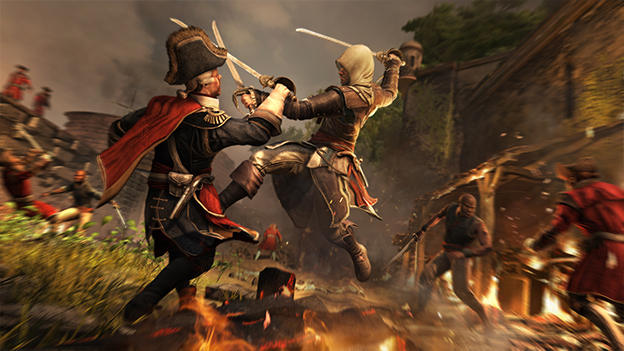 After stumbling with Connor, Ubisoft has found its footing with Edward Kenway as its pirate hero. Although it would have been a tempting prospect to repeat on success, Kenway isn't a smooth lady-charmer like Ezio. In fact, he's rather a lout at the start of the game, concerned with little more than making a fortune, so he can return home and get back into the graces of his estranged wife. Still, he has a rough charm about him that makes him worth rooting for. His slow transformation into a worthy Assassin is a nice piece of character development that does a lot to move the story forward. The “modern era” portion of the game has been reset somewhat, starring a nameless and faceless Abstergo employee who is plundering Desmond Miles' ancestral memory for video game footage. It's all very meta—Ubisoft is an in-game entity that is co-developing these Templar propaganda games with Abstergo—but as usual, it takes a backseat to the real historical meat of the game. Although it looks great on previous generation consoles, Black Flag is a game that deserves to be experienced on PC, PlayStation 4, or Xbox One. It is absolutely gorgeous in every way, from the colorful peeling paint on the walls of Havana to the way that water streams over the Jackdaw's deck to the rustling of leaves when Edward is stalking through the bushes. The game fully captures the feel of the Caribbean seas, and care was obviously taken to marry the technical merits of the graphics with a unified style. The character animations can be a bit herky-jerky at times, but it hardly matters when it's such a joy to explore the lush jungles and harsh seas of this world. Black Flag shines in the sound arena as well. Ubisoft's voice direction has matured, and the actors demonstrate a nice sense of subtlety in both their line delivery and their various accents. We've come a long way since good old Uncle Mario and the rest of the over-exaggerated Italian crew. Sound effects are excellent as well, especially at sea, where the audio really accentuates the difference between a smooth-sailing day and a roiling storm. 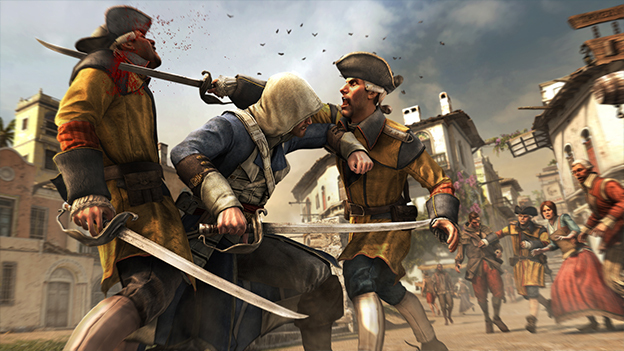 The centerpiece of Black Flag's sound design, however, is Edward's pirate crew. Not only do they cheer when he takes the wheel and yell out comments like, “The Captain's saltin' himself!” based on what's going on around them, they sing sea shanties. Particularly for fans of historical music, the shanties are pure magic, sung by a talented group whom put a good measure of roughness in the tunes, yet avoid the kind of truly authentic performance that would grate on the ears. Edward can collect an impressive number of these shanties, and hearing the crew sing them as they sail the Caribbean seas adds immeasurably to the experience. It's unfortunate that the lush audiovisuals seem to come at a small hit to performance. Don't get me wrong—the controls in general are the best they've ever been in the series, providing entertaining combat and largely smooth parkour gameplay. While playing, however, I noticed occasional reactivity issues and problems receiving on-screen button prompts in time to execute an action. While attempting stealth kills, I learned to mash the appropriate button before getting the “Assassinate” prompt, because if I waited for the prompt to appear on screen, half the time it would already be too late, and I'd be discovered by my prey. I compared notes with our PlayStation 3 reviewer, and he said that these issues felt more pronounced in the PlayStation 4 copy of the game than the PS3 version. It's not enough to seriously impede gameplay enjoyment, but it can make stealth missions and high-speed or precision platforming segments frustrating at times. Speaking of stealth missions, if there's one complaint that I can aim at the game's overall play value, it's that there's a bit too much emphasis placed on stealth during the game's main missions. For a game starring a rough and tumble pirate assassin, I felt like Edward had to spend a bit too much time skulking in bushes and eavesdropping on conversations. More missions including battles and involving the pirate crew would have been a nice change of pace, especially since Edward is quite handy with his dual swords and pistols, making out-and-out combat rather fun.